It looked like more of the same. For the fifth-straight game, Boston College softball’s Jessica Dreswick was orchestrating yet another dominant performance on the mound. Three innings into Friday evening’s game against Louisville, and the reigning ACC Pitcher of the Week was on pace for her third-consecutive scoreless outing. But in the fourth frame, Dreswick found herself in uncharted territory. The Eagles’ infield committed two throwing errors—just as many as the team had tallied in the past three games combined—moving the Cardinals into scoring position. And before long, Louisville made BC pay. Thanks to timely hitting and two more throwing errors, the Cardinals tacked on five runs. 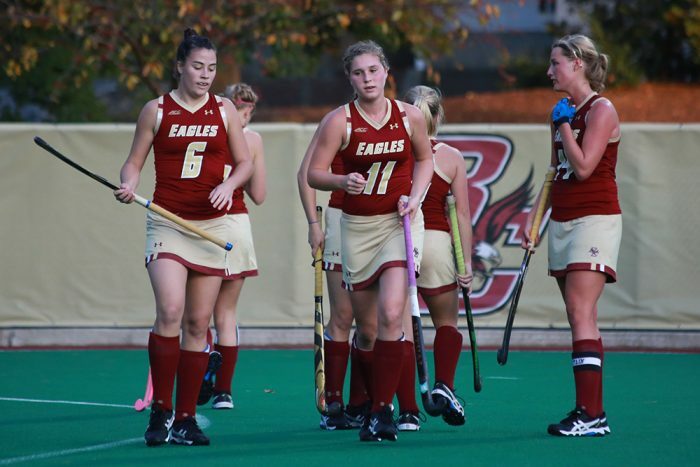 The scoring spree proved too much for the Eagles to overcome, as Louisville took the first game of the series, 5-3. The first few innings of the game consisted of a pitching duel and some small ball. Dreswick got things going by punching out Caitlin Ferguson in just four pitches. Jordan McNary reached first with a single, but Dreswick forced the next two Cardinal (22-10, 6-2 Atlantic Coast) batters to pop out and ground out, respectively. Then, the Eagles (21-13, 5-3) got lucky on the offensive end. Taylor Coroneos hit a grounder to third base, but a throwing error enabled her to make it to first. Tactically, Annie Murphy grounded out to third, advancing Coroneos into scoring position. Just like Murphy, Chloe Sharabba sacrificed herself to move Coroneos around the bases. Down in the count, Tatiana Cortez hit a ball toward third, but for the second time in the inning, the Cardinals’ throw missed the mark, Cortez reached first, and Coroneos scored. Dreswick and Maryssa Becker traded goose eggs for the next two innings. Both struck out a pair of batters in the second, and Becker executed a one-two-three to round out the third. But, the complexion of the game changed in the fourth. Nicole Pufahl grounded to third, but Cortez failed to make the throw to first. Next, Becker reached base on a fielder’s choice, as Pufahl was forced out at second. Once again, Louisville targeted Cortez. This time, Tiarra Sanabria hit it to the hot spot. Cortez ignored Sanabria and went for the lead runner at second, but her throw was off the mark. Both Becker and Sanbria were safe. Michala Riggle came in to pinch run for Becker, but she wouldn’t be on the base path for too long. Alison Szydlowski hit a grounder to shortstop, and Sharabba turned to third to get the force out. Shortly after that, Jenna Jordan scampered to first, following a Jordan Chimento throwing error from behind the plate. Chimento’s miscue was costly, as Sanabria scored and Szydlowski sped all the way to third. Already having tied the game, Louisville began to string together some hits. Morgan Meyer singled up the middle, bringing home Szydlowski. The ensuing batter, Ferguson, singled to right field, advancing Jordan to third and Meyer to second. Soon after that, Chimento failed to handle a Dreswick pitch, and the passed ball gave Jordan enough time to cross home plate. The unconventional, but highly potent scoring stretch ended with one more Eagles error. McNary hit one toward Sharabba, but the shortstop’s throw didn’t go as planned. As a result, Meyer and Ferguson scored, extending the Louisville lead to 5-1. After the inning, Dreswick was replaced by Jordan Weed. Meanwhile, Becker just kept on rolling. Louisville’s ace held BC hitless until the fifth inning. She wouldn’t give up another one until the seventh—that’s when the Eagles attempted their comeback. Down by four runs, Cortez ignited a rally with a single to center field. After Chimento was robbed of a line drive, Allyson Moore singled. Megan Overton would take her place on the base path. Then Lexi DiEmmaneule lined out, giving Cortez the opportunity to tag up and advance to third. With runners on first and third, Weed doubled to right field, scoring Cortez and Overton. The deficit was cut to two, and that’s as close as the Eagles would get. Carly Severini grounded out to shortstop to end the game. This one was as ugly as it gets. For a long time, BC had more errors than it did hits. If the Eagles want to win this series, they’ll have to polish up their defensive play. With Dreswick shouldering so much of the workload on the mound, the infield must cut down on its mistakes. Saturday and Sunday’s games will be crucial, as BC and Louisville are neck and neck in the ACC standings, behind the two powerhouses—North Carolina and Florida State.